The English Standard Version translation is founded on the belief that the words of the Bible are the very words of God. Setting itself apart from other translations by sacrificing neither accuracy nor readability, the ESV is an "essentially literal" translation that seeks to duplicate the original texts while taking into account the differences between modern English and the original languages. ESV sets a new standard—and is truly a Bible for all people. 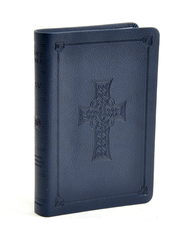 The ESV Bible combines "word-for-word" precision and accuracy with literary excellence, beauty, and readability. With it's timeless quality and enduering relevance, you will find the ESV Bible ideal for reading, studying, teaching, and sharing every day. Precise, powerful, and a pleasure to read, for the ESV is the Bible for Life. "What the Bible Is All About"
"What the Bible Says About..."
"God's Plan To Save You"
Compact size: 6.00" x 4.00" x 0.75"